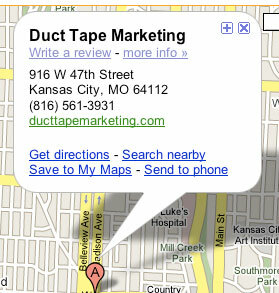 Google Maps (Google’s local directory) has recently started showing user reviews in it’s business directory listings. First, off if you haven’t listed your business in Google Maps – go here now and do so. Even if your business is in the listing take the time to sign up for a free account and enhance your listing. You can add product photos, hours of business, forms of payment, product lines. Great stuff for local searchers. Now, you can also add a review. (Or have some of your raving fans do so) Just surf to any local listing like this one for Duct Tape Marketing and take a look at the bubble on the map. Click on the “write a review” link and you can add your review of a local business. Initially it appears that they are also pulling reviews from other social sites like Insider Pages and Judy’s Book. Managing your online reputation through these social directory has become an increasingly important tool. What’s Included in a Perfectly Optimized Homepage?